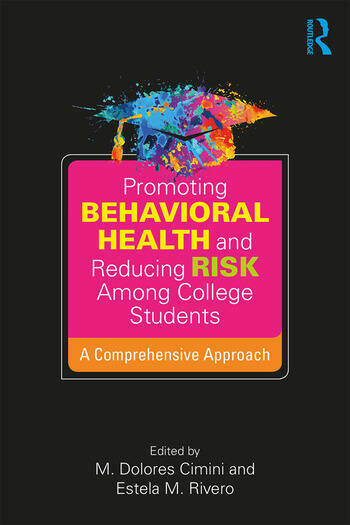 Promoting Behavioral Health and Reducing Risk Among College Students synthesizes the large body of research on college students’ behavioral health and offers guidance on applying evidence-based prevention and early intervention strategies using a comprehensive public health framework. Chapters authored by leading researchers and practitioners address a broad spectrum of important behavioral health issues, interventions, and challenges. Moving beyond a theoretical discussion to strategies for implementation, this book addresses the special issues and potential barriers faced by practitioners as they translate research to practice, such as resource limitations, organizational resistance, challenges to program sustainability, and the unique needs of special populations. This cutting-edge compendium will appeal to both practitioners and researchers involved in providing prevention, early intervention, and treatment services for college students. M. Dolores Cimini, PhD is a licensed psychologist, director of the Center for Behavioral Health Promotion and Applied Research, and adjunct clinical professor at the University at Albany, SUNY, where she has led comprehensive prevention efforts for more than two decades. Estela M. Rivero, PhD is a licensed psychologist, assistant vice president for student affairs, and adjunct clinical professor at the University at Albany, SUNY, where she oversees Student Health Services and Counseling and Psychological Services, as well as the Center for Behavioral Health Promotion and Applied Research.